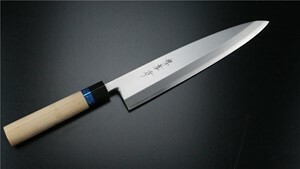 The Miroishi Deba knife is an elongated version of the traditional Deba knife. It was crafted and manufactured so that cooks and chefs who primarily serve seafood cuisine, and who need to constantly fillet fish could use it for general purposes as well, without having the need to switch between other knives. 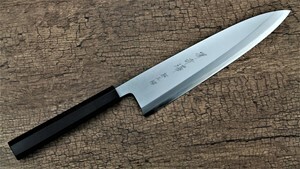 The Miroishi Deba therefore saves “seafood” cooks and chefs time, which is essential in a professional kitchen, and makes overall workflow efficient.